Shrek Forever After made me roar with delight and giving me a chance to fall in love with the movies all over again. This is one of the best in the series since the first. It has been a while since I have watched a movie leaving the theater feeling great. DreamWorks shows off their amazing animation skill. With moments like the muscles in Shrek's hand to the nose flair when he gets literally huffing mad. In this movie there is a noticeable leap forward in animation detail. Shrek Forever After is a perfect movie: A perfect date movie, A perfect family movie, even a perfect fun movie. They strike an amazing balance between romance, drama, action and jokes. Even the end credits are a perfect recap of the previous 3 movies! Donkey's waffel fairy and postulating on his mutant babies. A pampered Puss In Boots. I want and angry hat! "If I'm your true love then where were you when I needed you?" "The Best part of the day is he got to fall in love all over again"
"It was you who rescued me." I have loved all of the Shrek movies and expect to really enjoy this as well. I have some concerns over Rumpelstiltskin looking like a troll on the poster, what is up with that? They address that in the movie it's a hilarious moment. 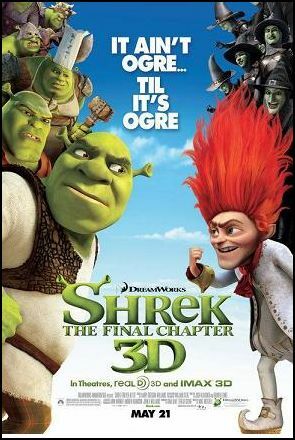 Shrek Forever After will hit theaters 21 May 2010. After all of his adventures, Shrek has become a domesticated family ogre. Instead of scaring villagers away as he used to, Shrek agrees to autograph pitchforks. Longing for the days when he felt like a “real ogre”, Shrek is tricked into signing a pact with the smooth-talking deal maker, Rumpelstiltskin. After signing the contract, Shrek discovers he has been tricked, and the day Rumpelstiltskin took out of Shrek’s life was the day that he was born-meaning that he never existed. Now, stuck in a twisted alternate version of Far Far Away where he has to gather the gang and fix everything. I love the Puss In Boots Character and can't wait to see what antics he gets up to in this movie.